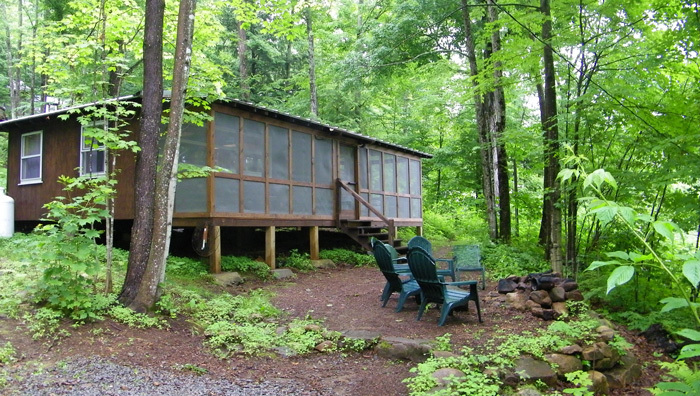 Each cabin is unique and requires its own particular description. 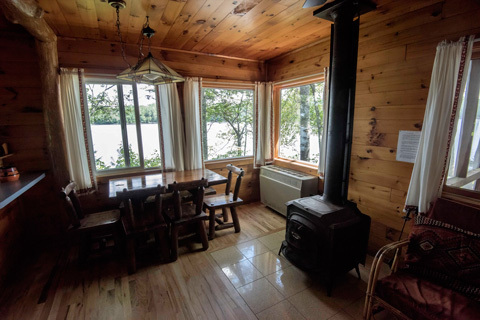 Prices are based on proximity to the lake, the size of the cabin and the number of people accommodated, and how well renovated and equipped with extra features such as central heat. 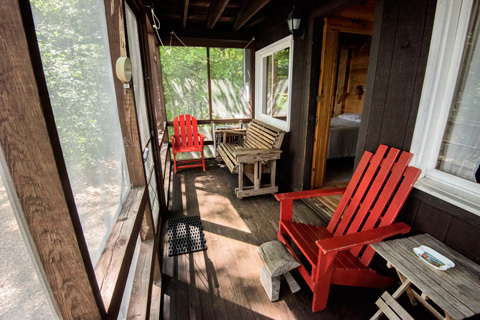 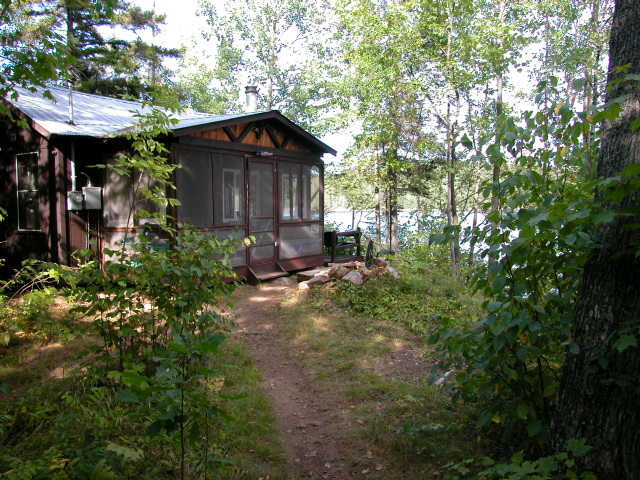 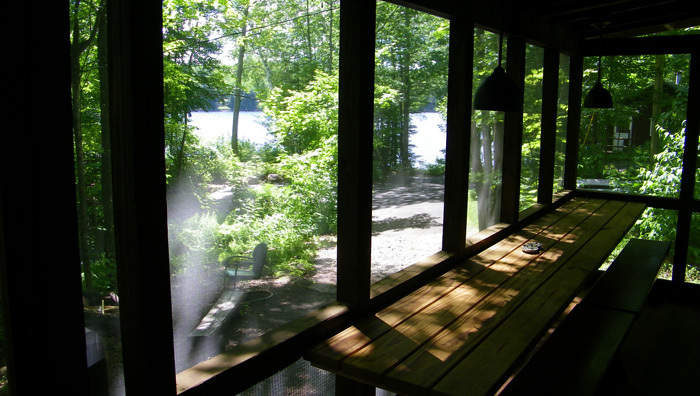 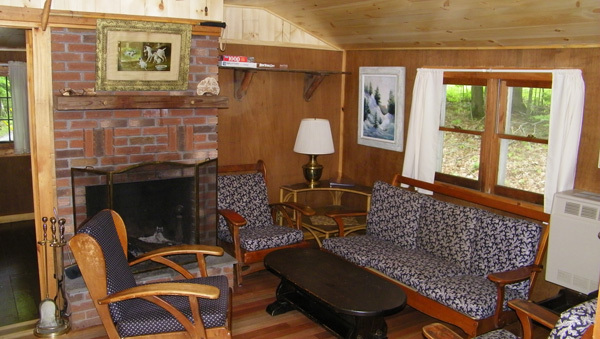 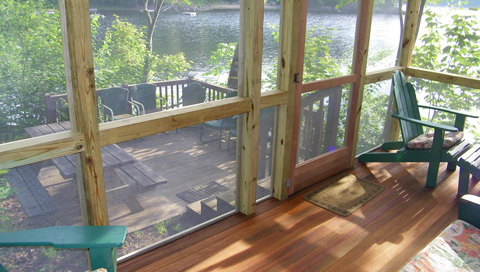 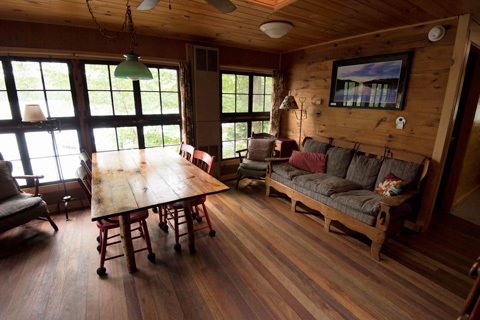 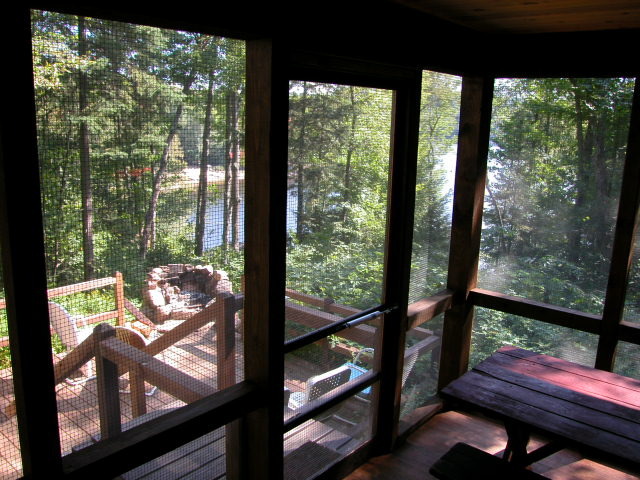 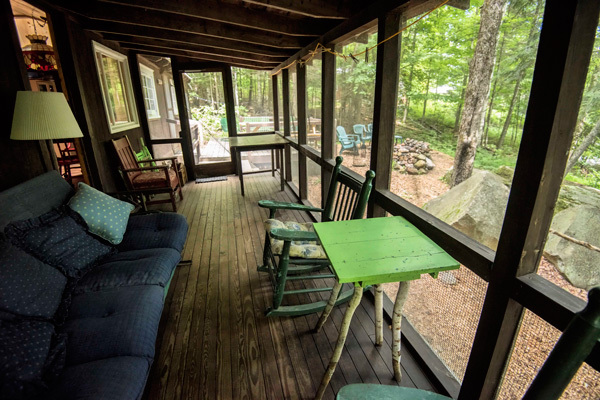 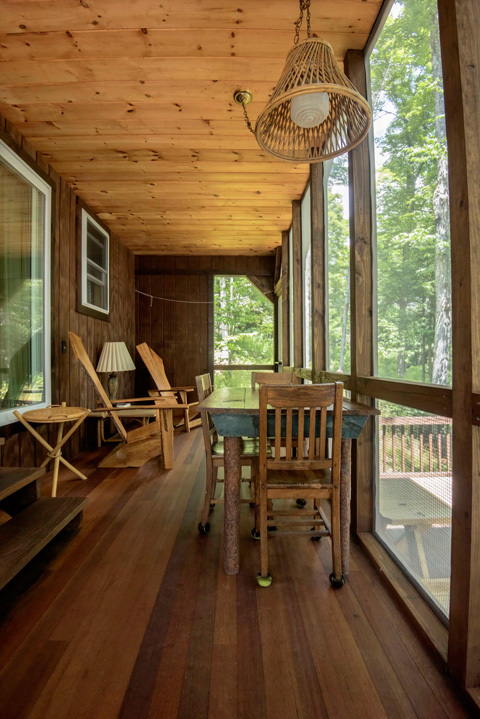 A very cozy and comfortable cabin with picture window & large deck all focused on dramatic lake views. 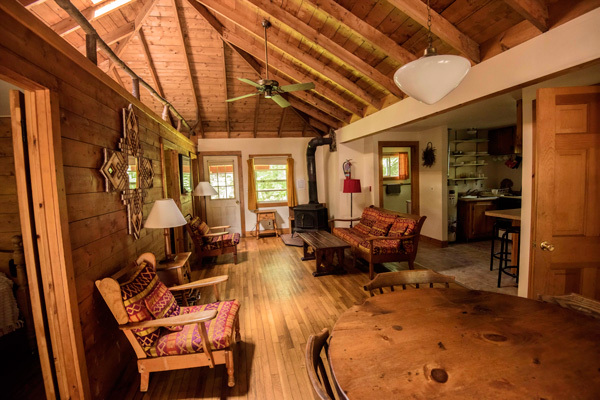 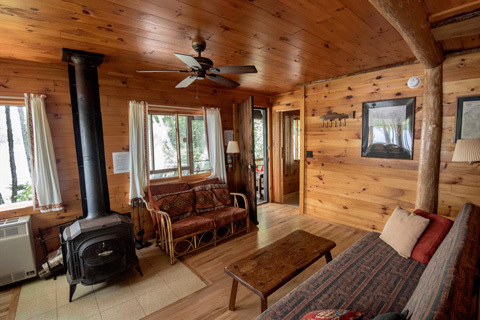 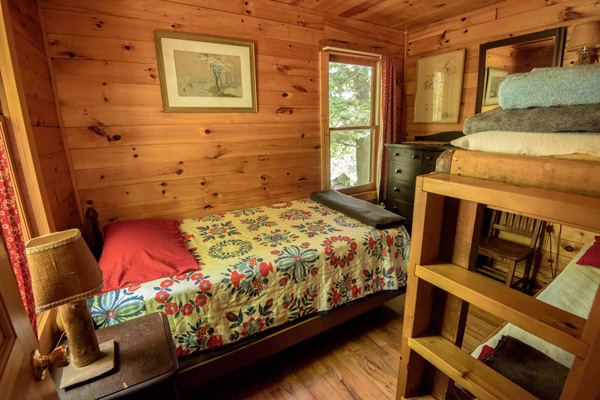 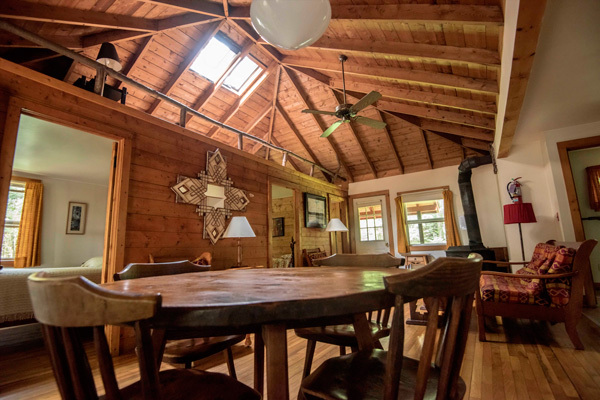 Completely finished in knotty pine, with yellow pine floors; sleeps 6 in 3 bedrooms (queen, twins, bunks); screened dining porch; skylight; Vermont Castings fireplace-style woodstove, central heat; shower. 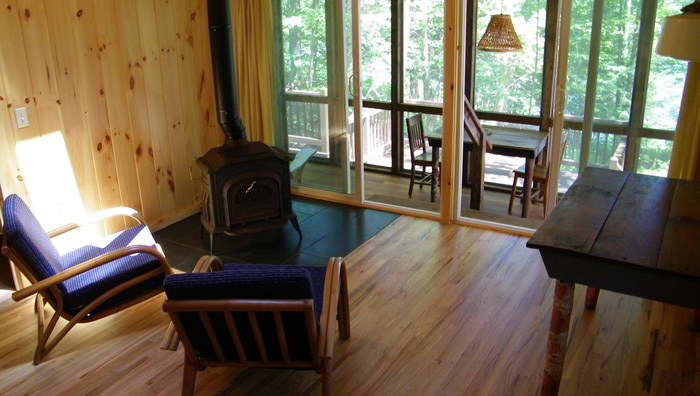 Click for more information and off-season rates. 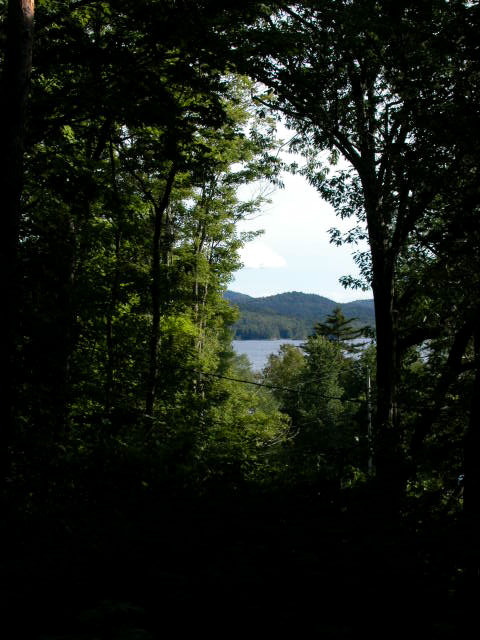 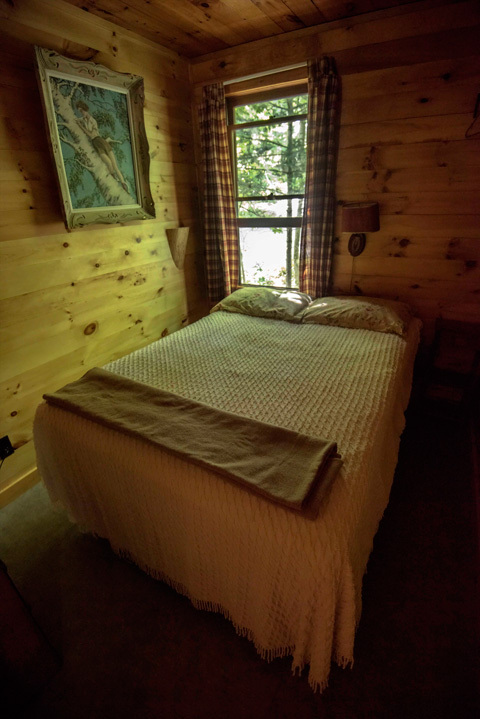 Comfortable, serene, newly-renovated, finished throughout in knotty pine; sleeps 6 in 3 bedrooms, (queen, full, bunks); huge screened, dining porch; lake views; skylights; Vermont Castings fireplace-style woodstove; gas heat; shower. 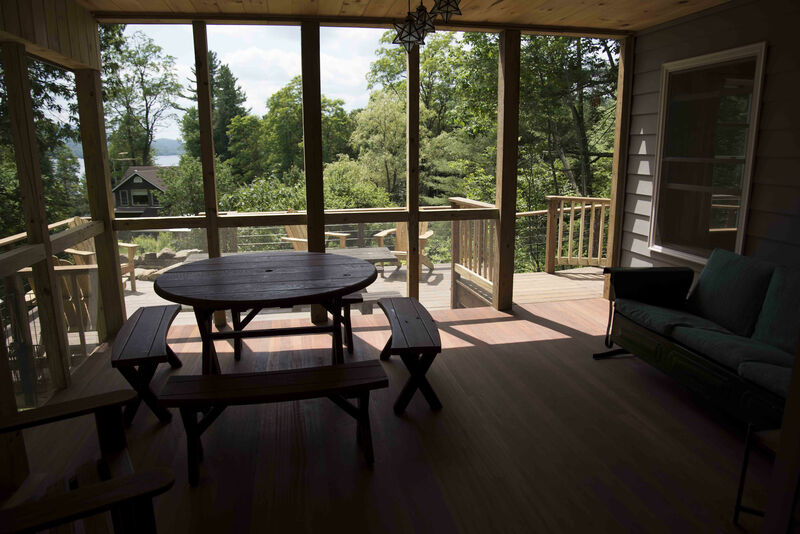 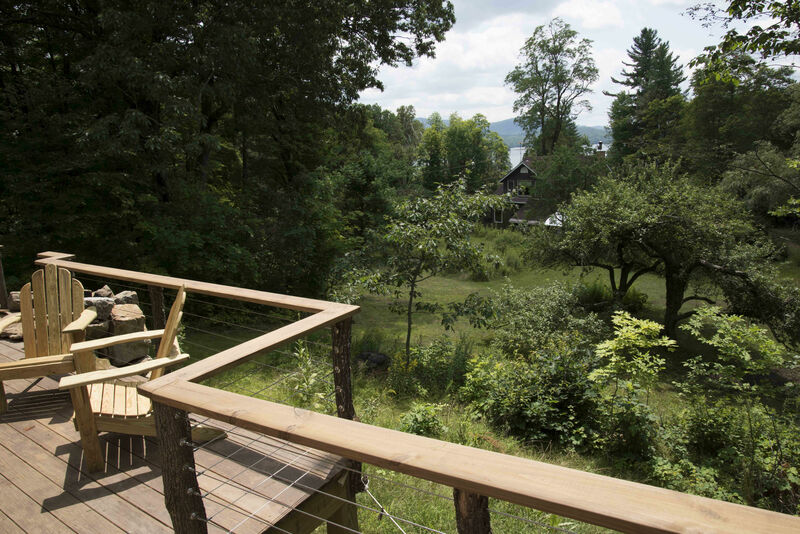 Located on a promontory, with expansive views of the lake; the cabin is completely finished in knotty pine with oak floors. 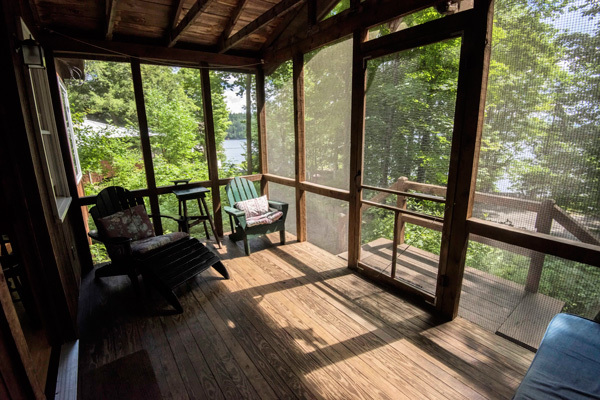 It sleeps 6 in 3 bedrooms (queen, full, bunks); Vermont Castings fireplace-style woodstove; gas heat; shower; screened porch; deck; spacious yard w/ picnic table and a fireplace centered in front of a spectacular lake view. 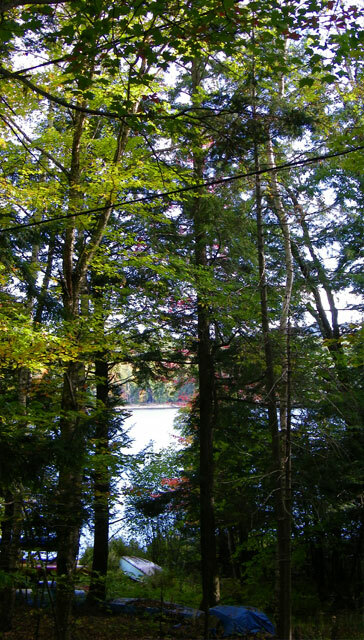 The Birch is 15 feet from the shore. 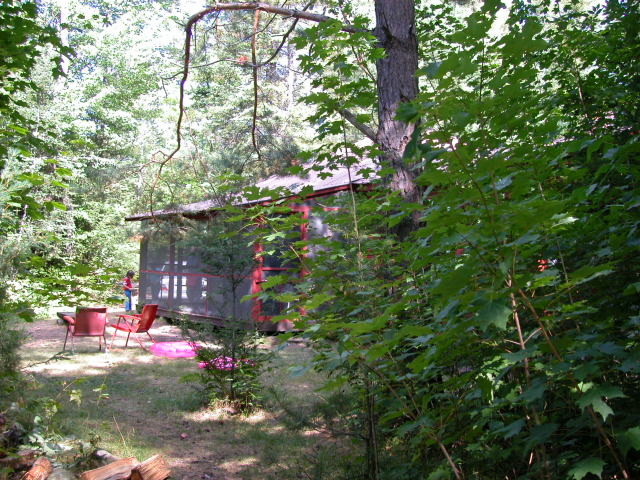 Next to the beach in the big cove, the Cedar is breezy and light. 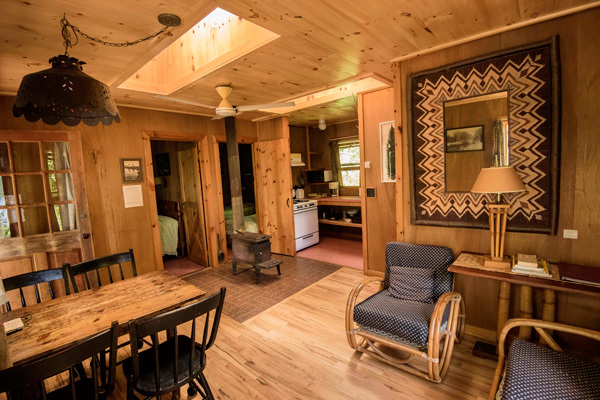 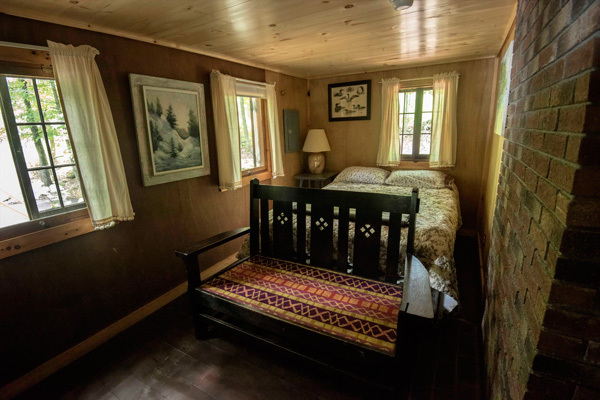 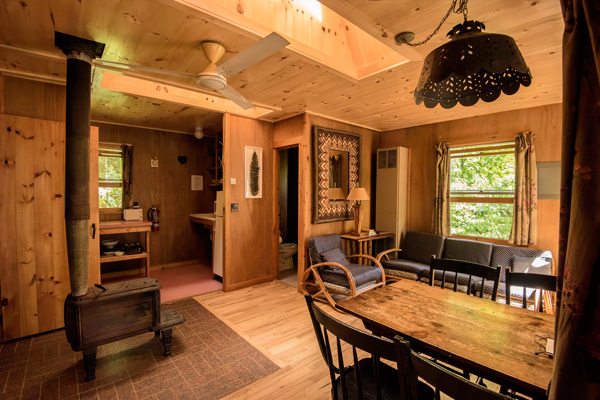 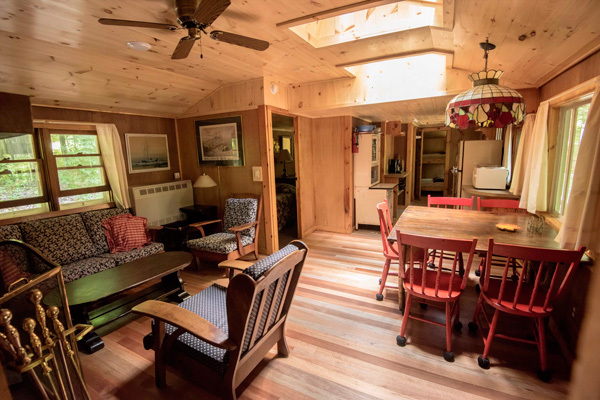 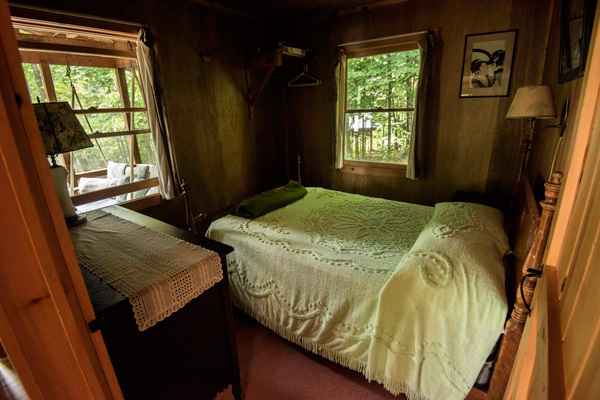 It sleeps 5 in 2 bedrooms (double/ single & bunks); mahogany floor; new, larger screened dining porch; deck w/ picnic table; skylight; Vermont Castings fireplace-style woodstove, gas heat; shower. 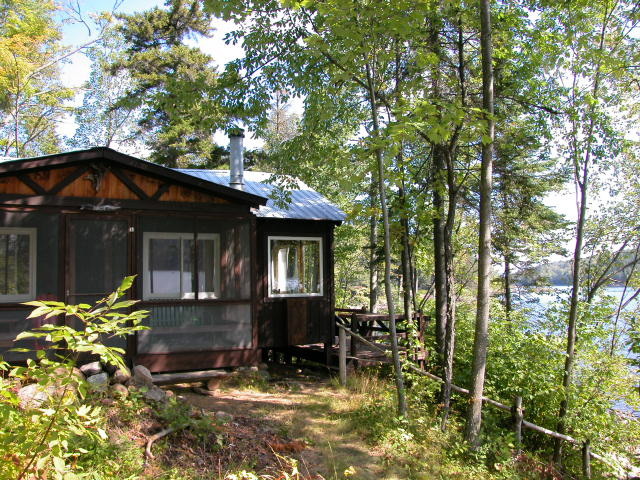 The cabin is 15 feet from the shore. 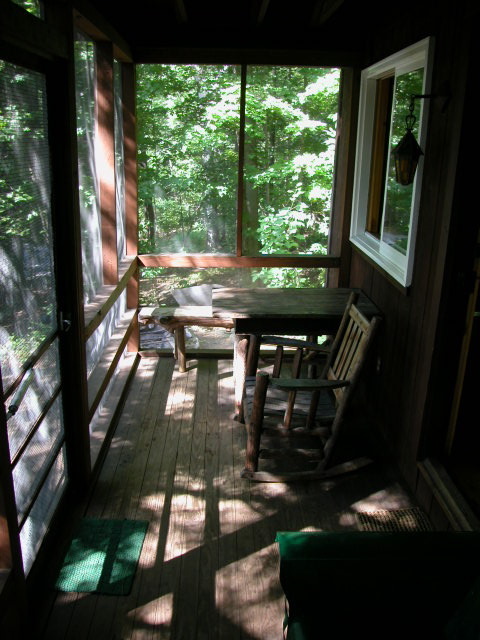 A tiny jewel. 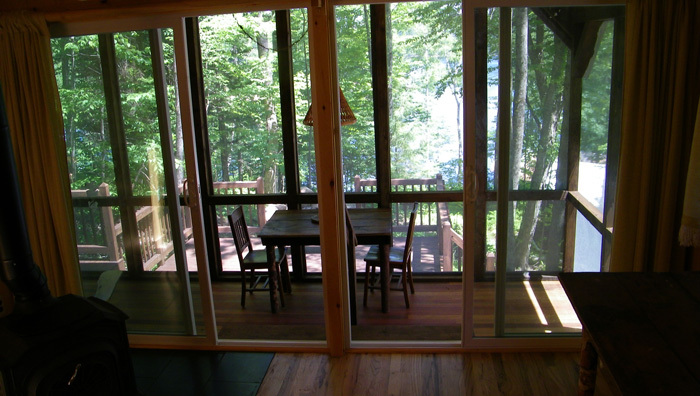 Double patio doors opening onto a large screened, dining porch, with attached deck and fireplace. 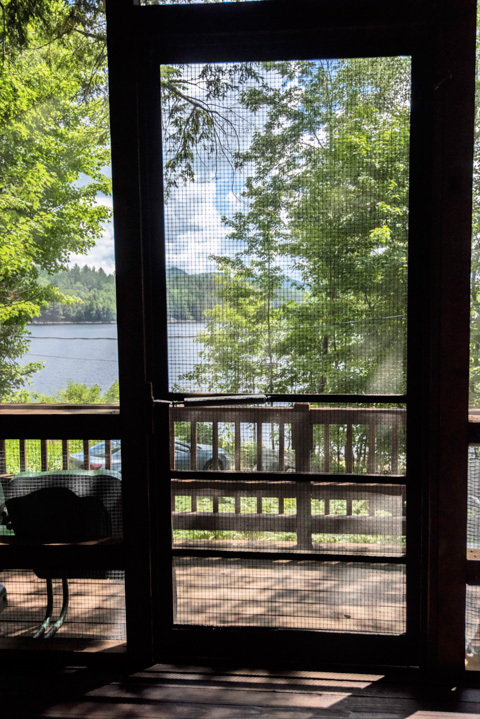 Lake views. 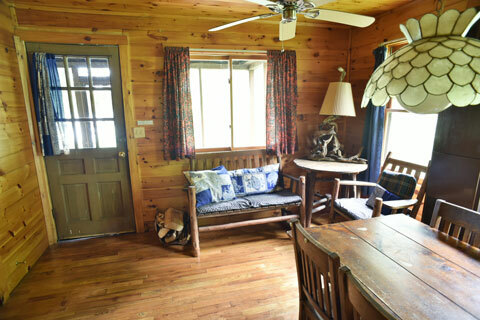 Completely finished in knotty pine with oak floors. 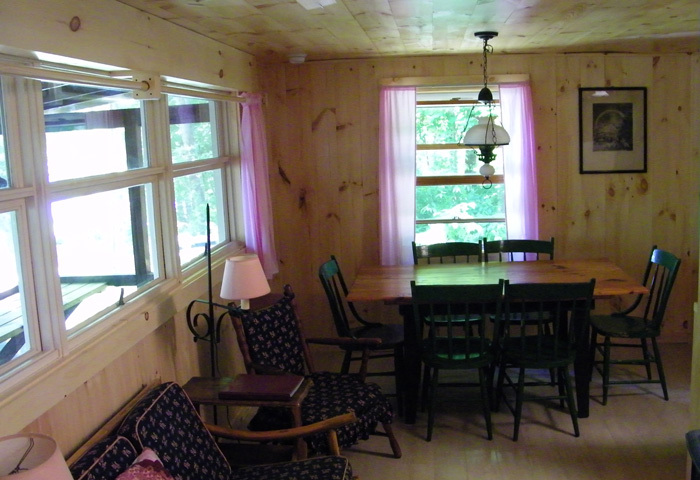 Sleeps 3 in one bedroom (w/ a queen) and a daybed in the living room. 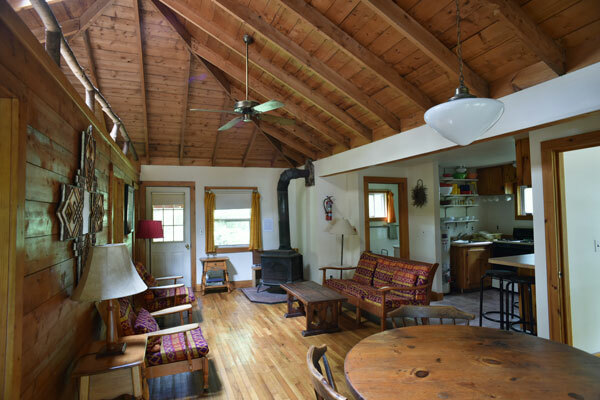 Skylight, Vermont Castings fireplace-style woodstove, propane heat, shower, picnic table. 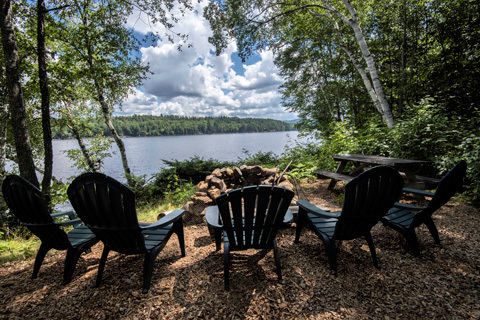 Directly on the water, at the center of the large cove at the north end of Camp. 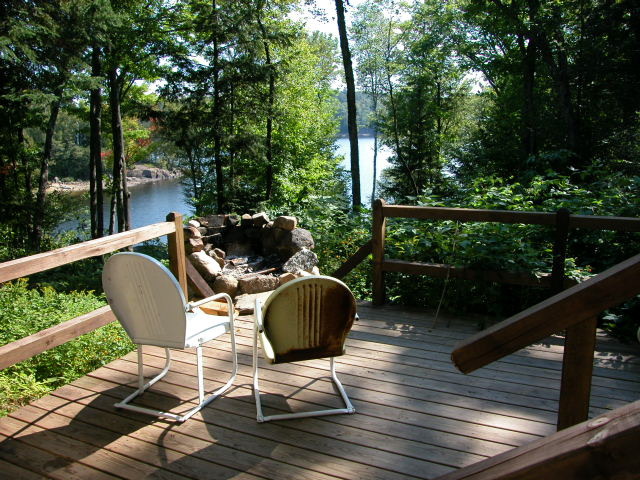 Very peaceful and private. 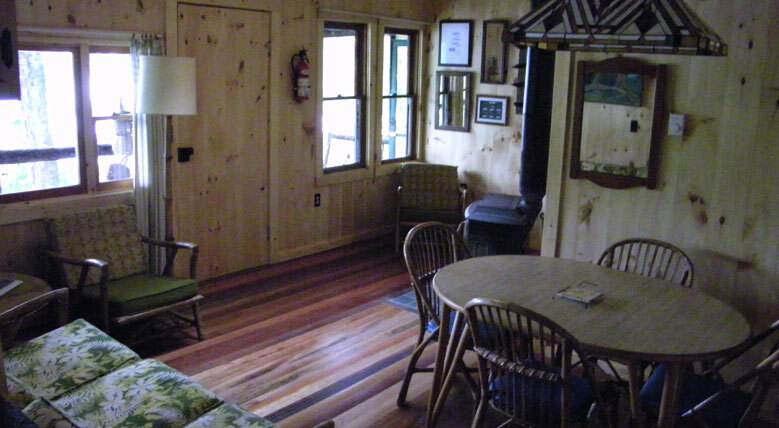 Finished in knotty pine throughout, with mahogany floors. 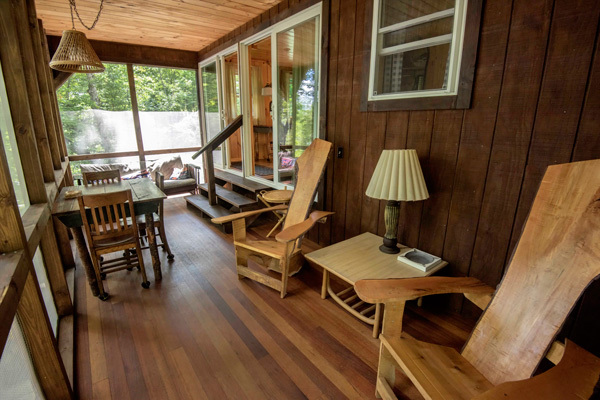 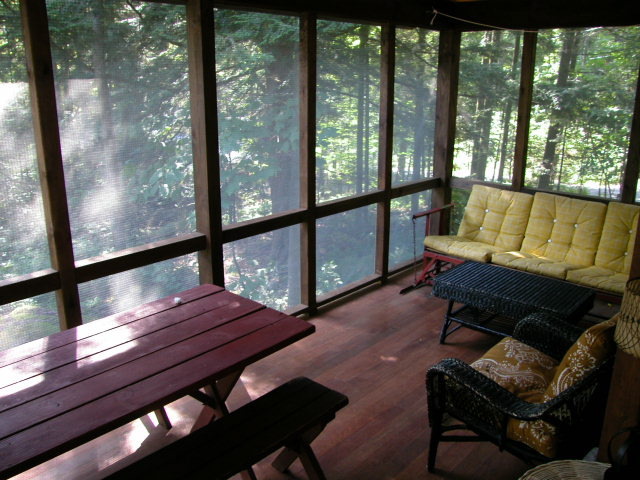 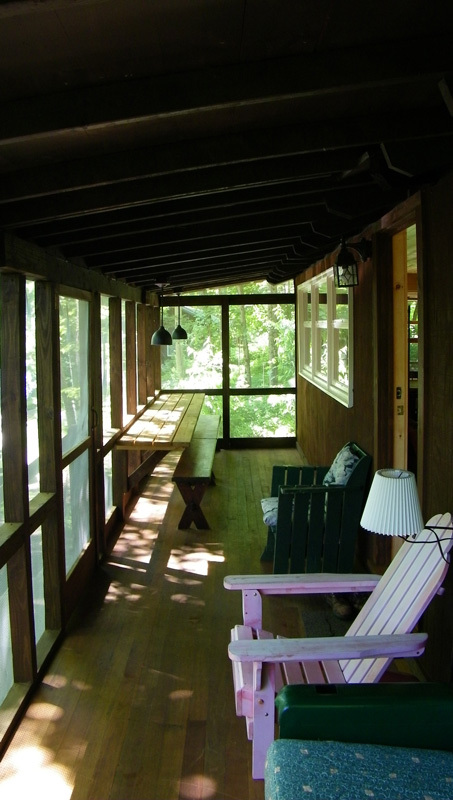 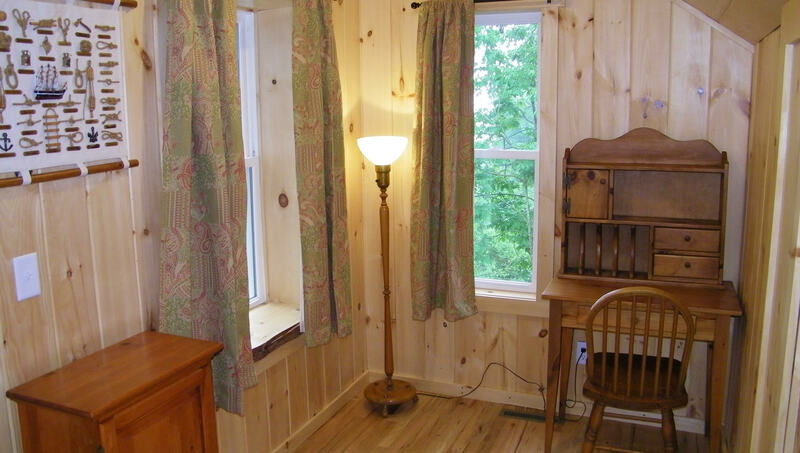 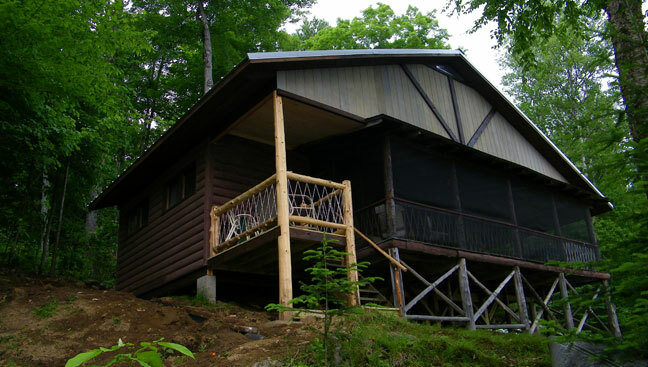 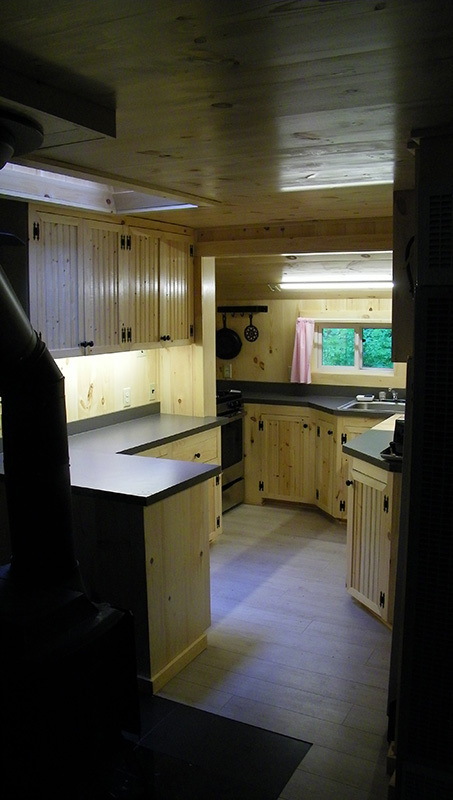 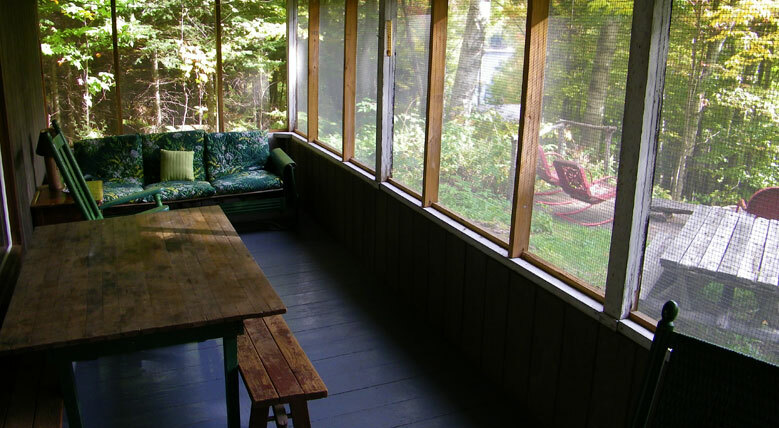 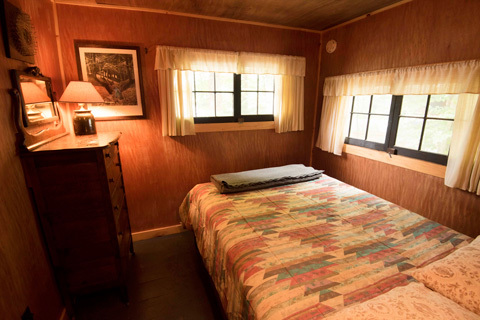 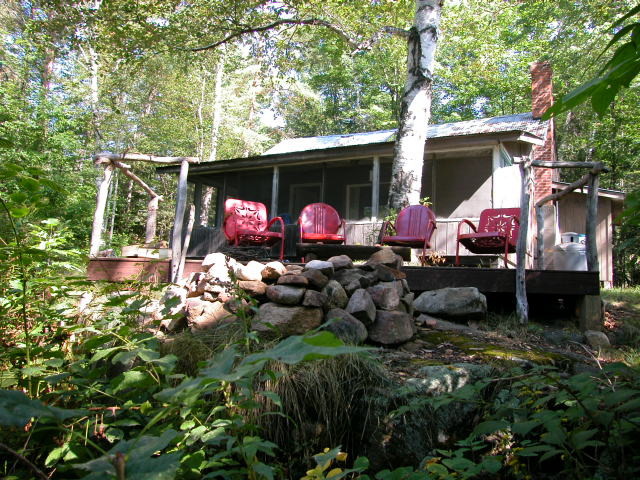 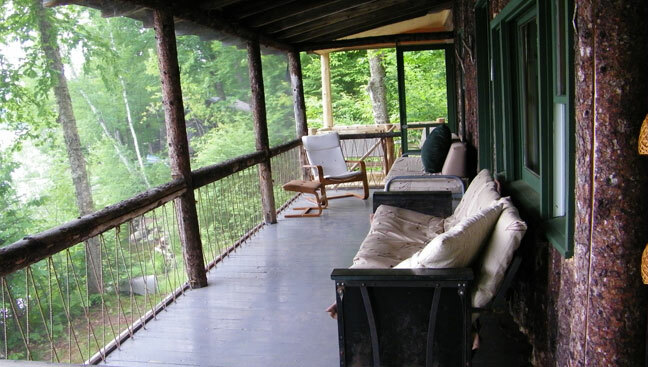 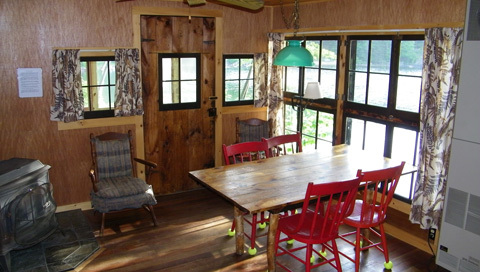 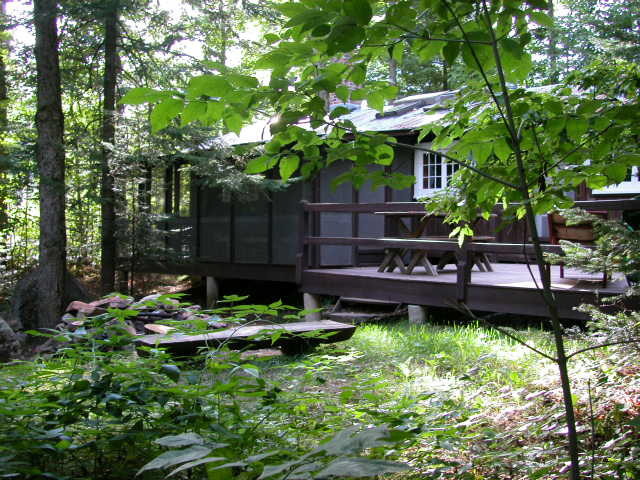 Sleeps 4 in 2 bedrooms (queen / full & single); huge wrap-around screened dining porch; skylight. 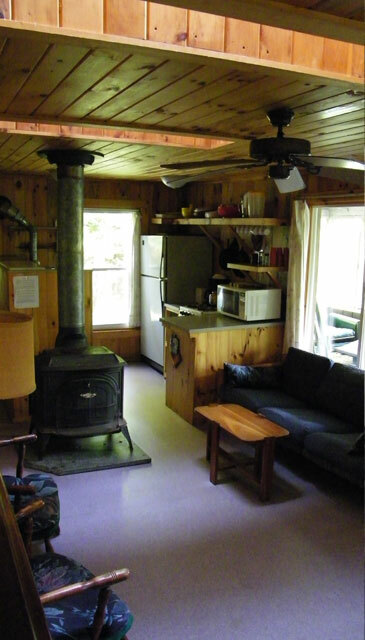 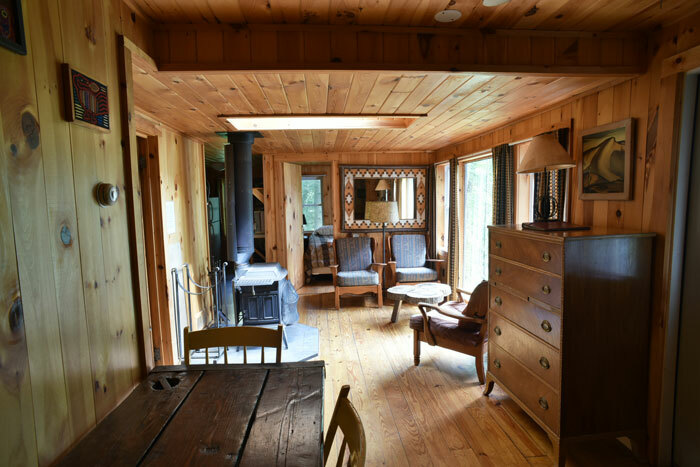 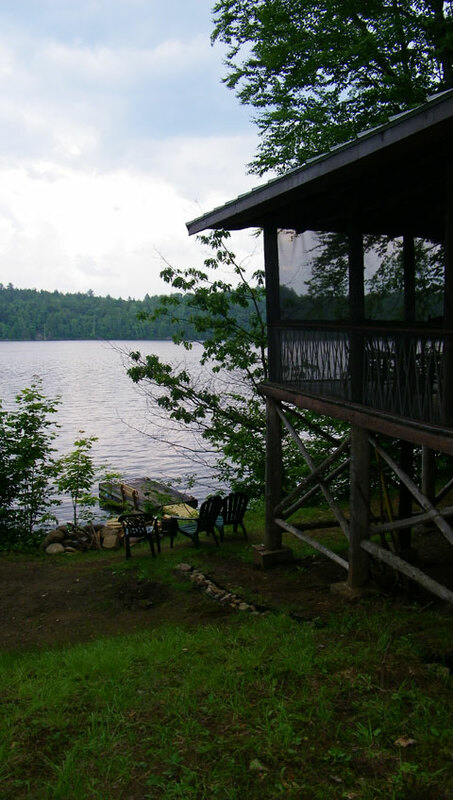 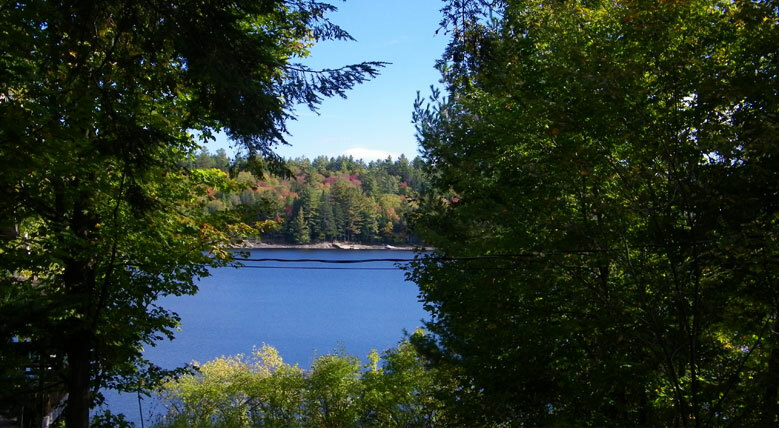 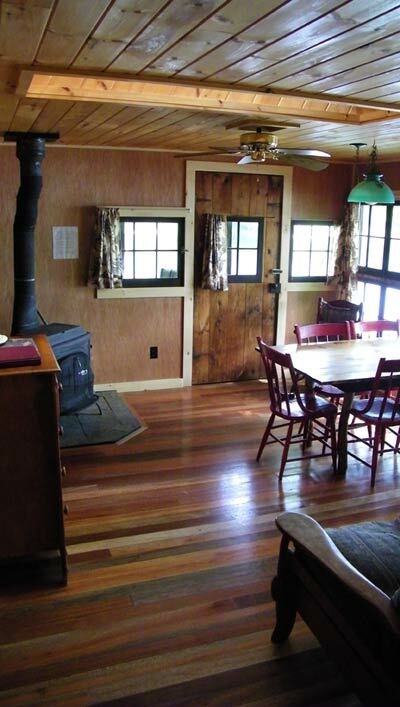 Vermont Castings fireplace-style woodstove and electric heat; shower; private dock w/ rowboat & canoe. 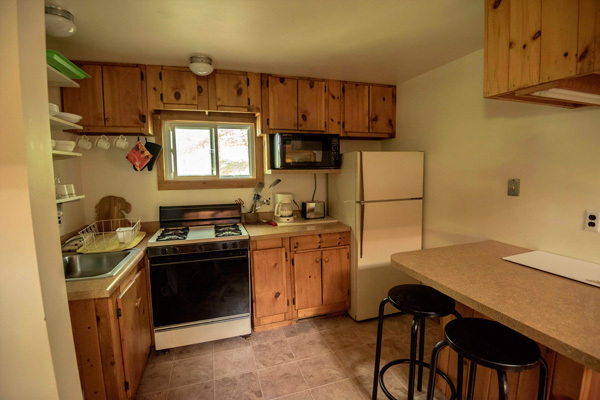 $1,475. 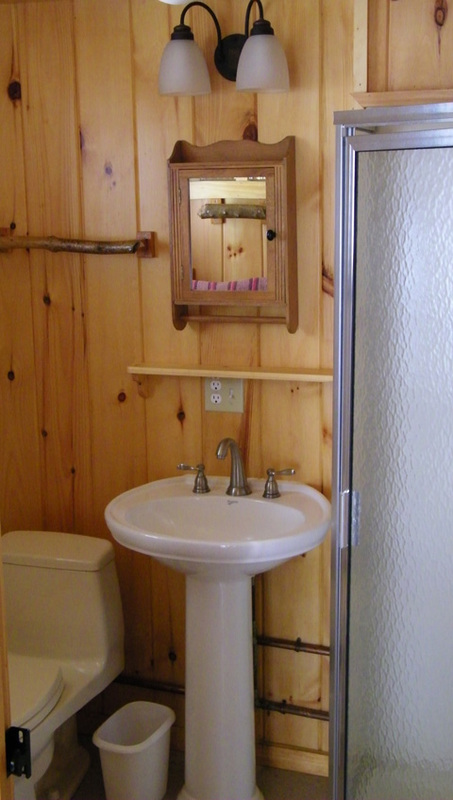 per week./ $215. 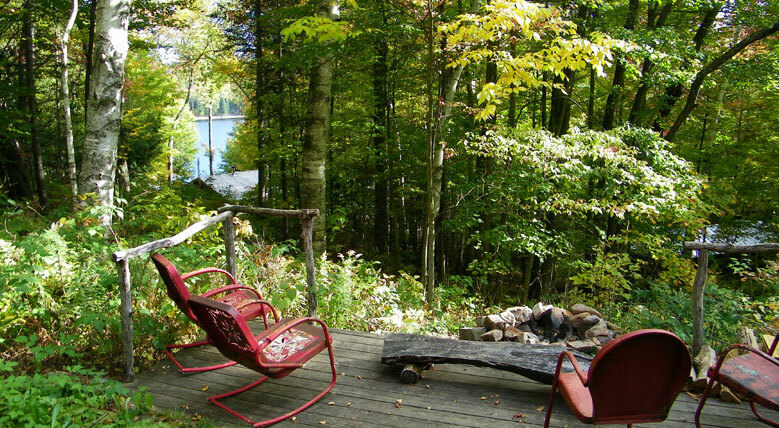 per day during peak season. 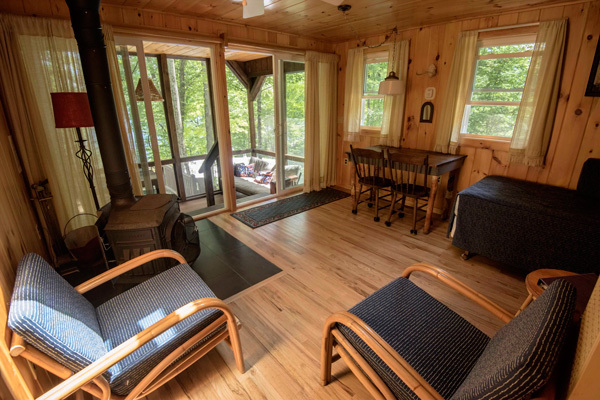 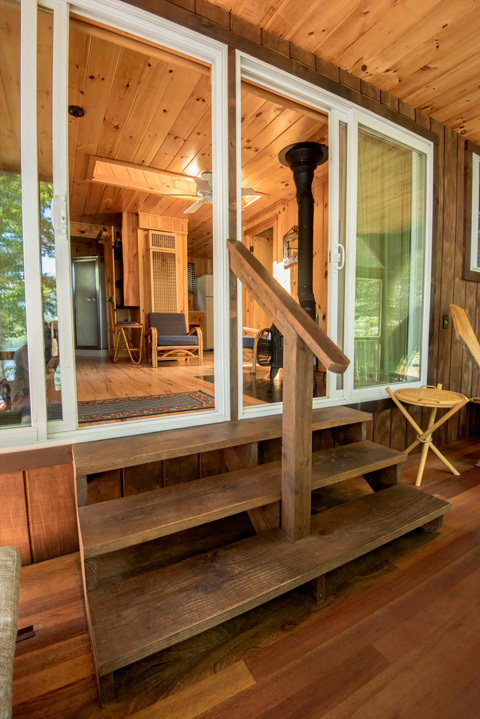 Compactly built, finished in knotty pine throughout, with oak floors, and charming rustic furnishings; sleeps 4 in 2 bedrooms (queen, single and bunks); screened dining porch; deck; lake view; Vermont Castings fireplace-style woodstove, gas heat; shower. 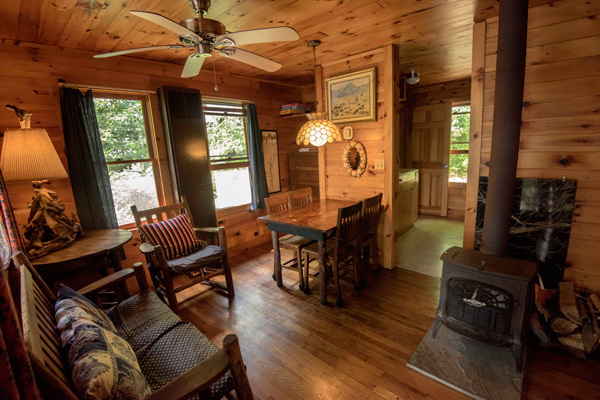 Roomy and comfortable, sleeps 6 in 3 bedrooms (queen, twins and bunks); mahogany floor; large screened dining porch; large deck w/ picnic table; brick fireplace plus gas heat; small lake view; skylights; shower. 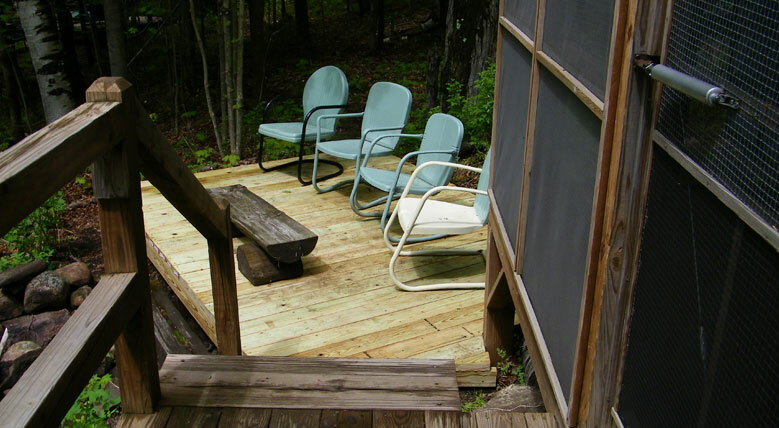 Older, compact, traditional-style cabin with painted finishes, located on a sloping lawn w/ picnic table, good location for toddlers; sleeps 6 in 2 bedrooms (queen, twins and bunks); large screened porch; lake view; woodstove, gas heat; bathtub only. 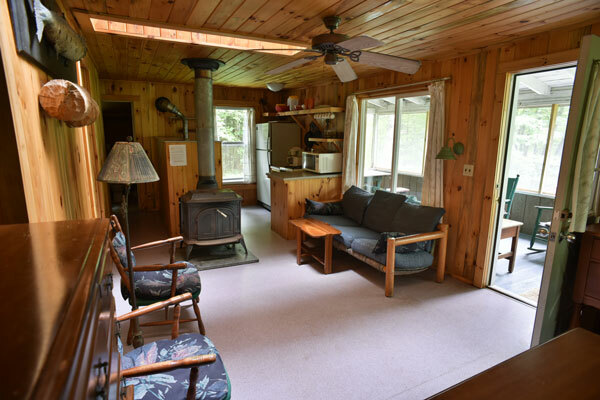 Roomy, with painted & knotty pine finishes, oak floors, sleeps 4 in 3 bedrooms (double, singles), plus a carpeted sleeping loft under skylights; screened porch; flat lawn area w/ picnic table; lake view; Vermont Castings fireplace-style woodstove, central heat; tub/shower. 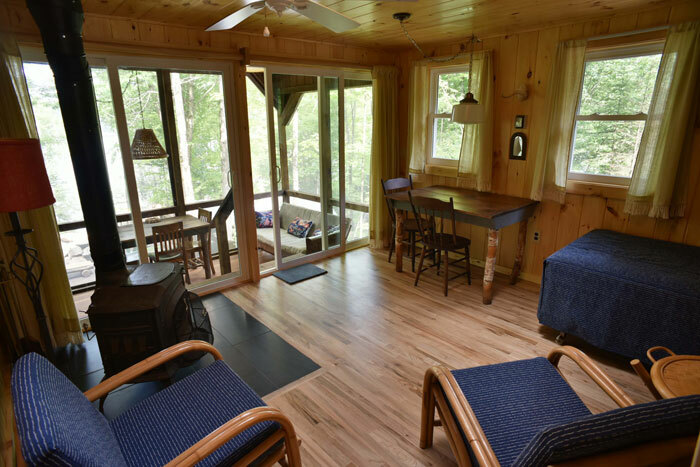 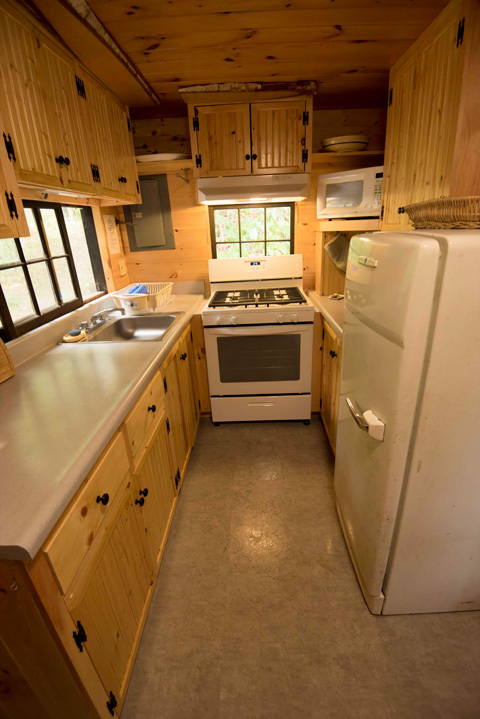 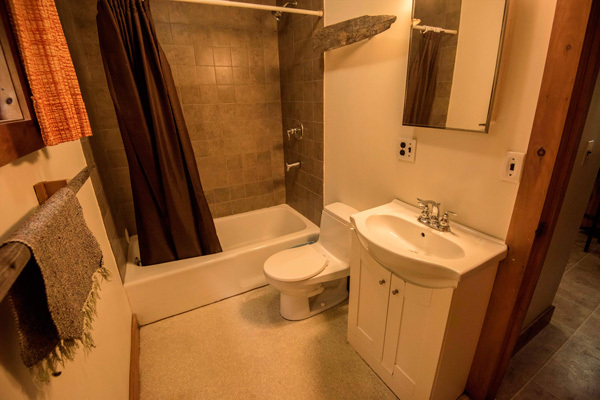 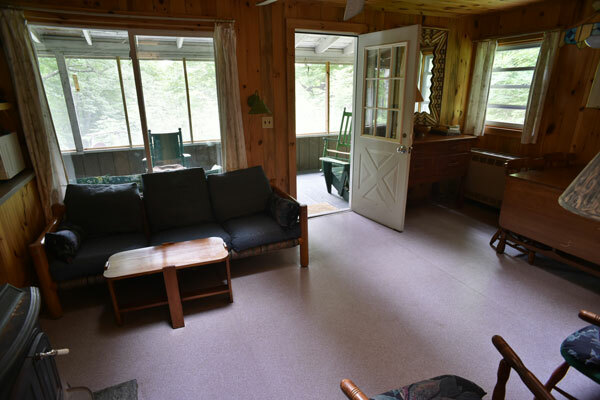 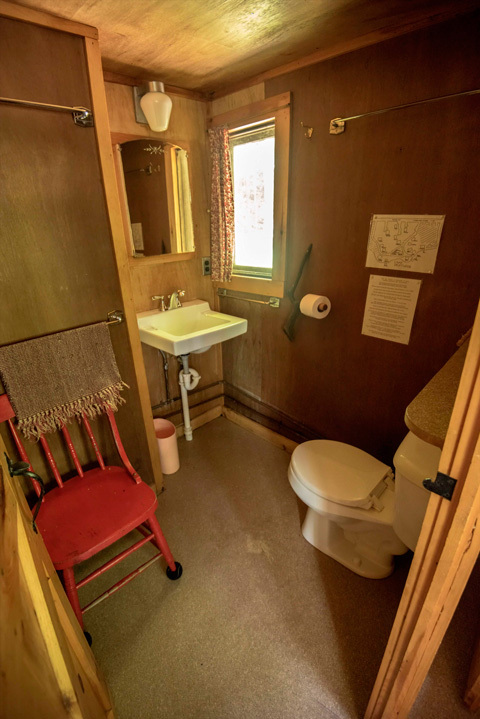 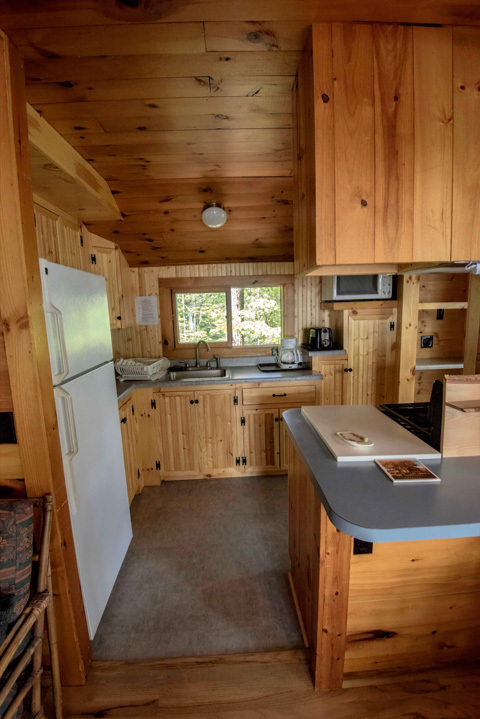 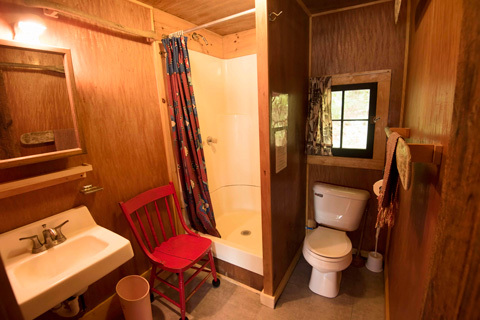 Breezy & bright, newer cabin, sleeps 4 in 2 bedrooms (double, twins); knotty pine, oak floors, screened porch and small deck; lake view; skylights; woodstove, gas heat; shower. 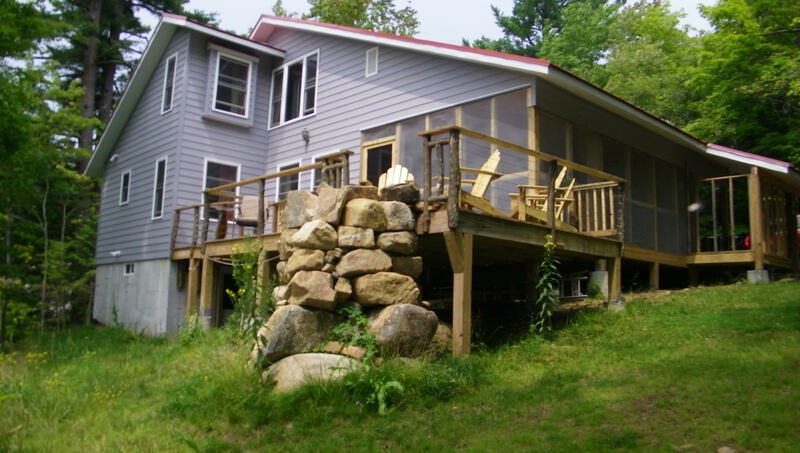 Beautifully finished in grey-streaked knotty pine, sleeps 6 in 3 bedrooms (double, twins, bunks); huge screened dining porch; lake view; deck & picnic table; skylights; Vermont Castings fireplace-style woodstove, gas heat; bathtub and shower. 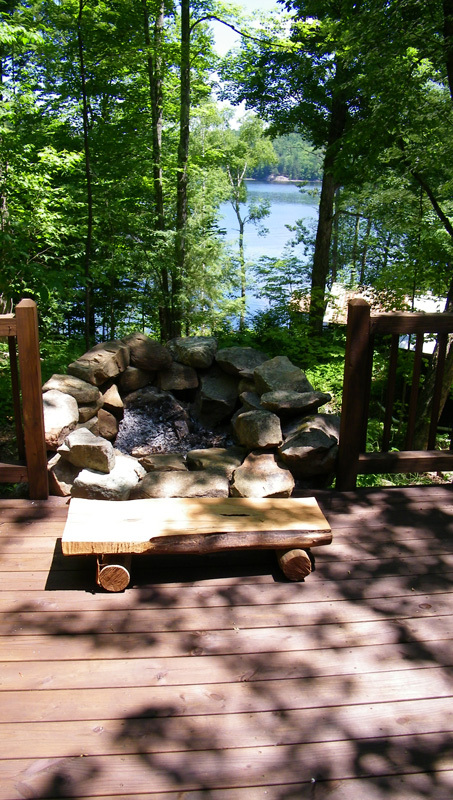 All cabins have outdoor fireplaces. 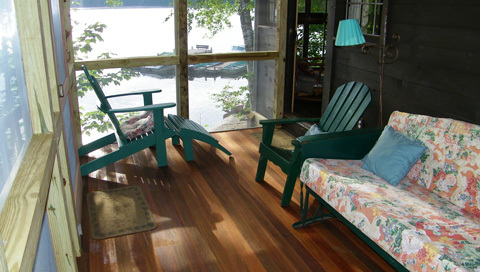 Firewood, rowboats, canoes, kayaks and a sailboat are provided at no extra charge. 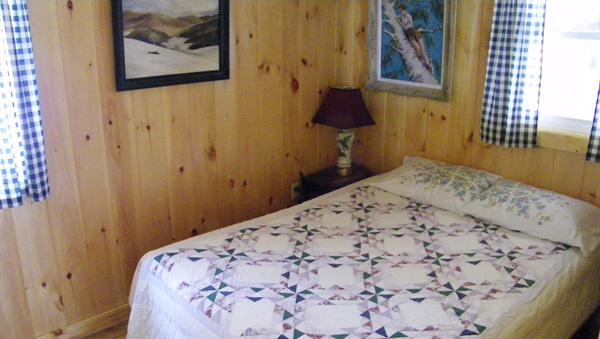 Linens are not normally provided, but can be made available for special circumstances. 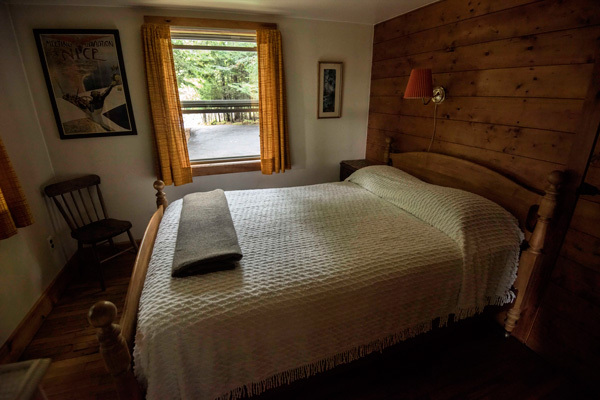 Pillows and one blanket come with each bed. 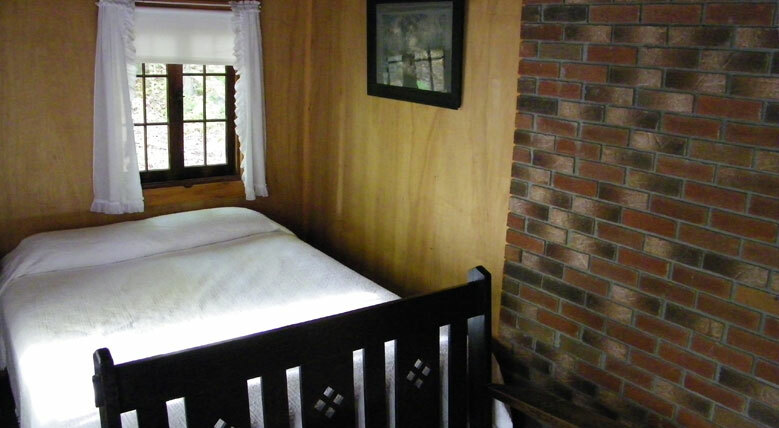 Extra blankets should be brought, unless you arrange for linen service. 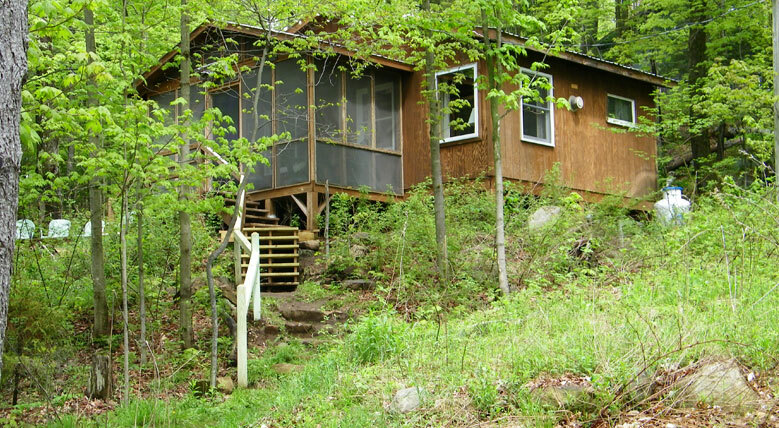 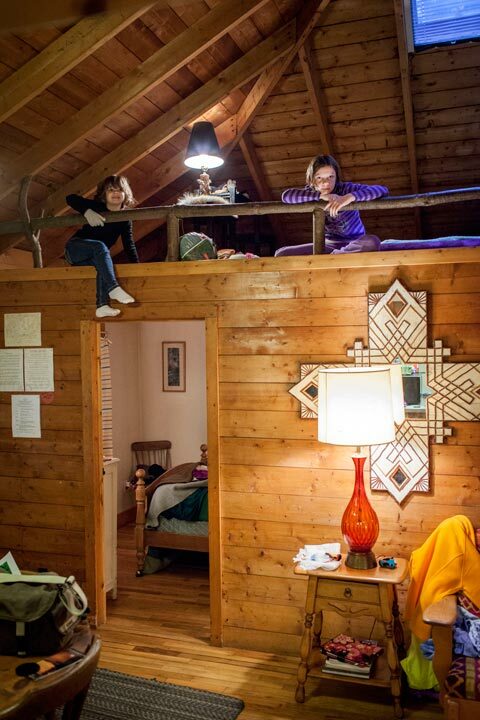 No extra people are allowed overnight in the cabins. 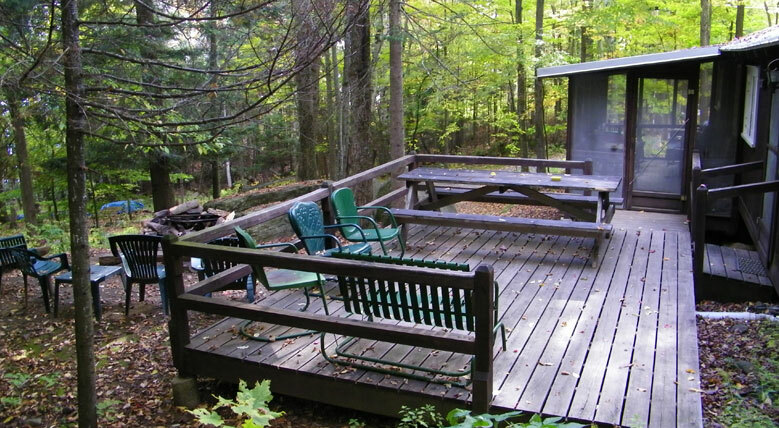 Smoking is not allowed inside the cabins. 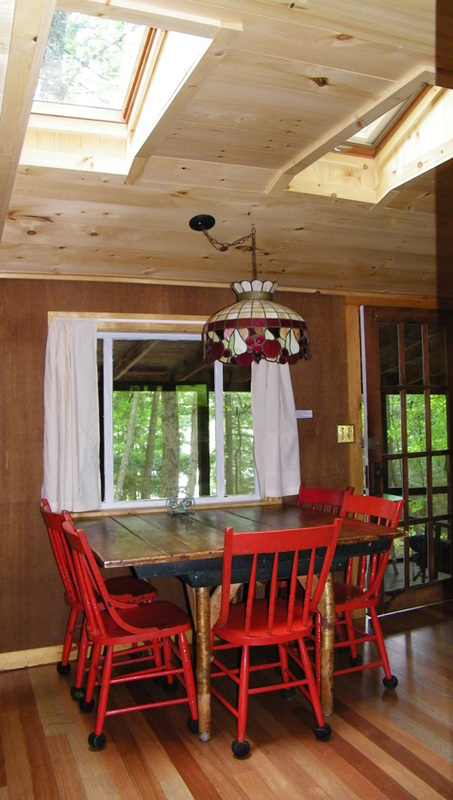 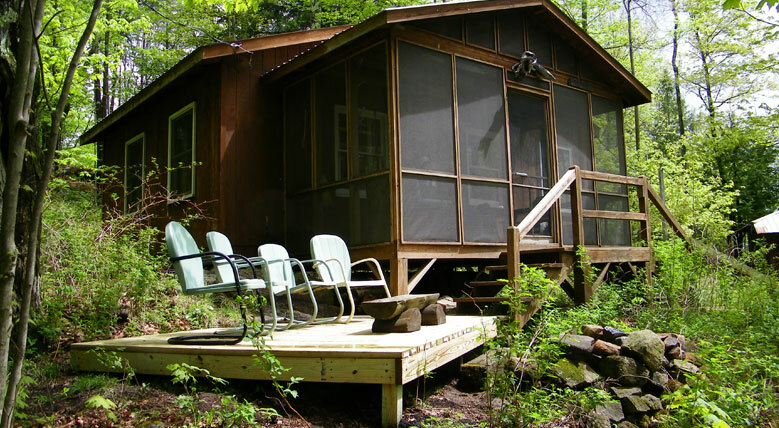 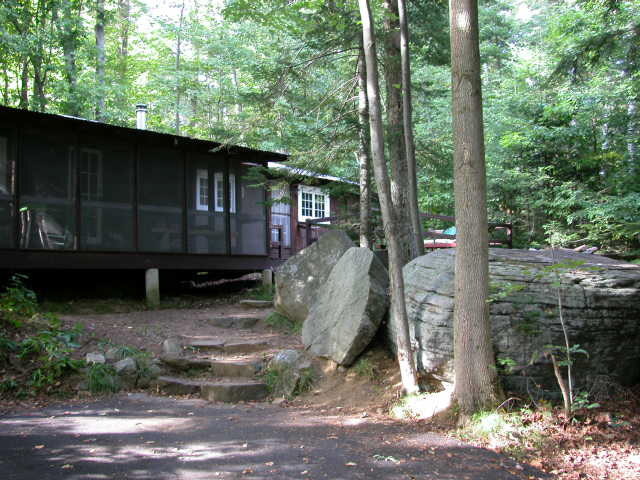 Cabins are rented only by the week (Saturday to Saturday) from the end of June through August. 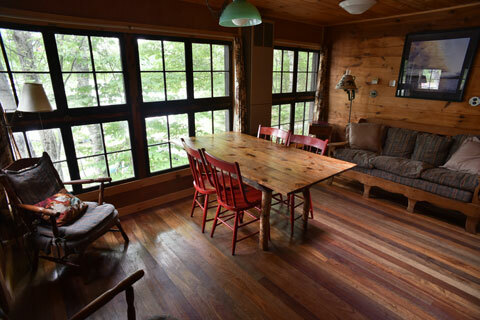 Weekend and daily rentals are available during the rest of the year. 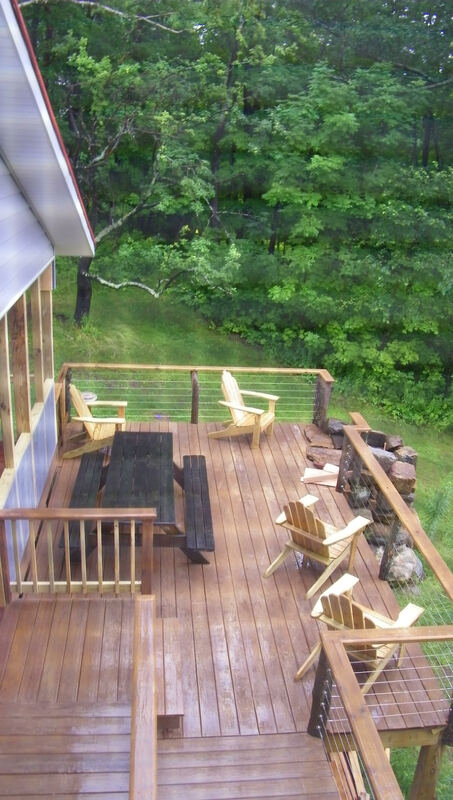 Check out time is 10:30AM on summer Saturdays, or any other time of the year when same-day changeovers occur. 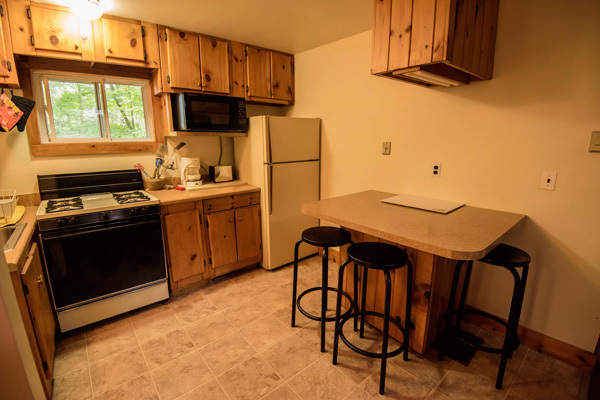 At other times, checkout may be extended, with permission. 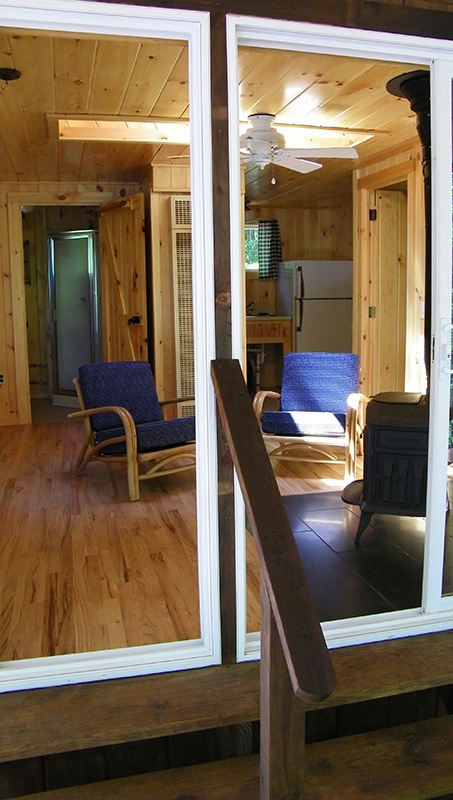 Cabins are usually readied for check-in by 2PM. 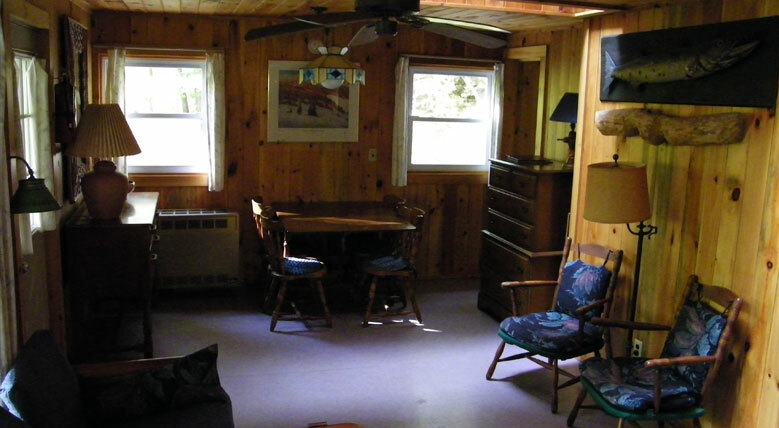 We do not accept credit cards. 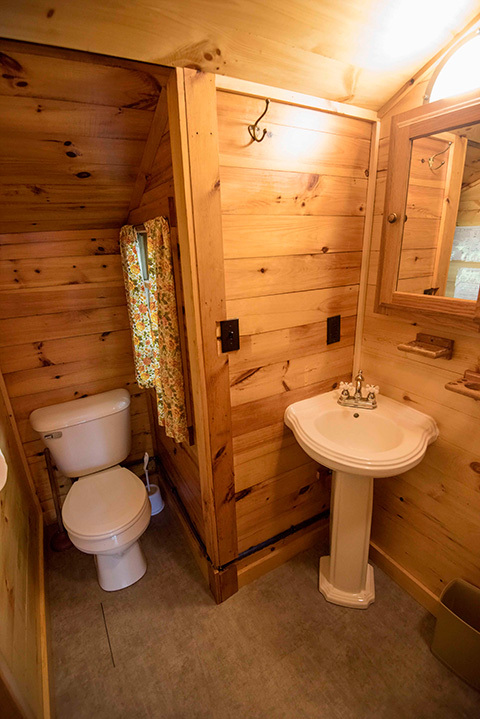 Cash or checks only. 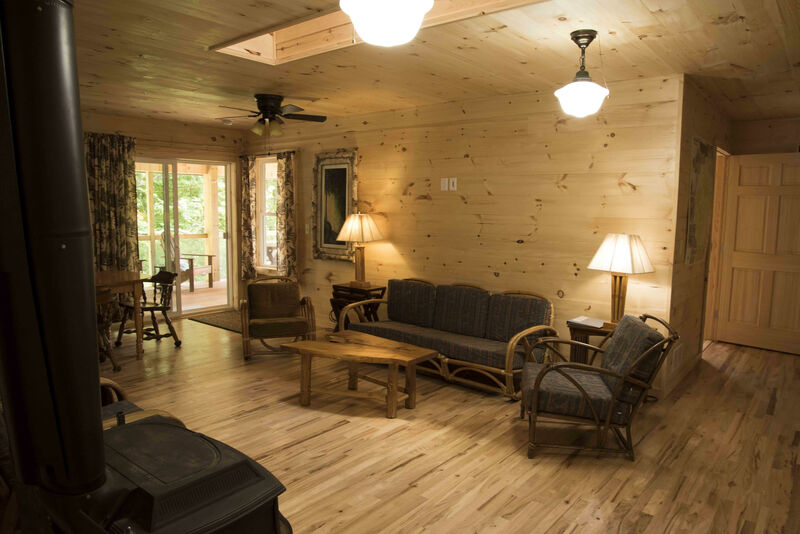 A deposit of 50% of the cabin rent is required to hold a reservation. 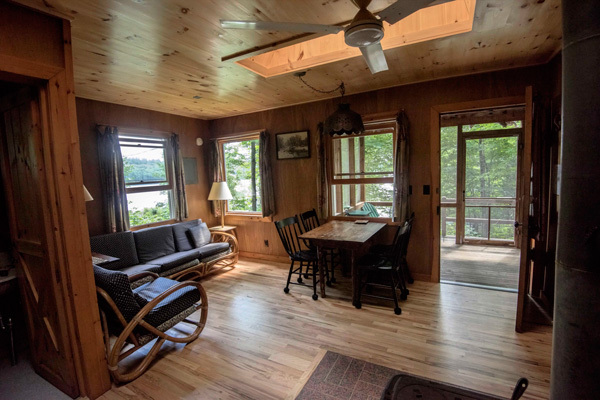 Deposits are refundable, minus a $25 service charge, only if notice of cancellation is given in sufficient time that we are able to re-rent the cabin. 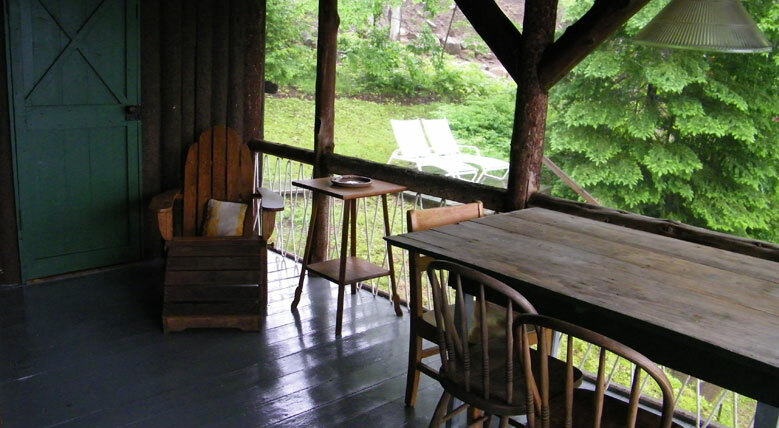 For stays of two weeks or longer: discount 3%. 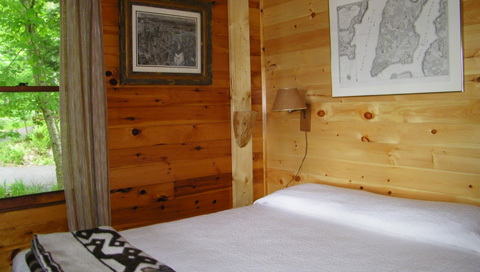 For stays of three weeks or longer: discount 6%. 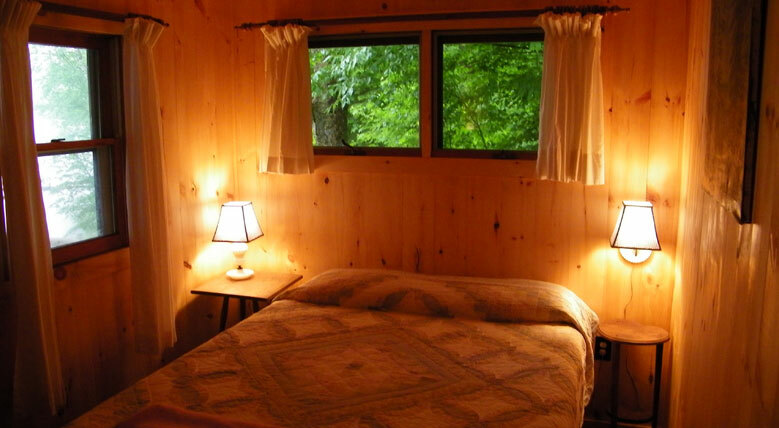 For stays of four weeks or longer: discount 9%. 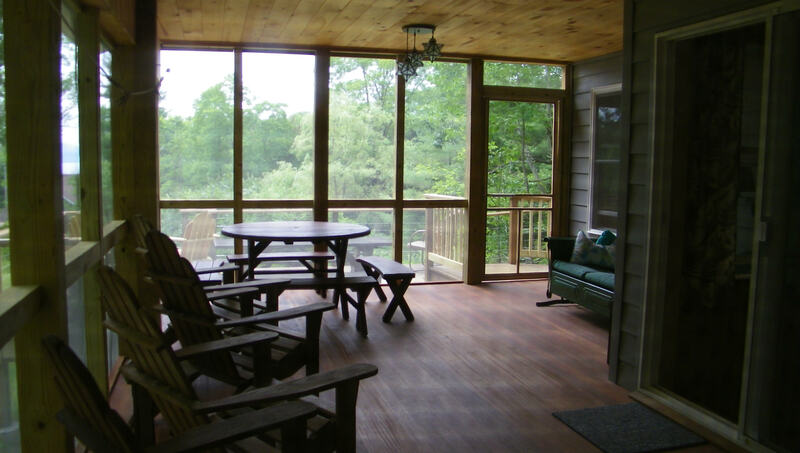 Between Columbus Day and Christmas and after Presidents' Week until the third week in June (not including Memorial Day weekend): discount 20%. 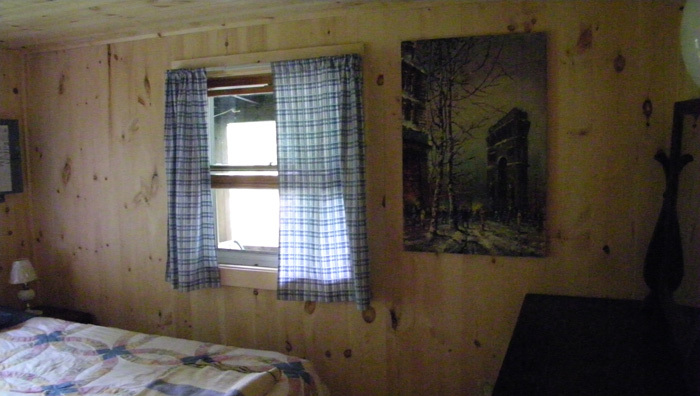 After Columbus Day until the third week of June stay two weekday nights and get a third night for free. 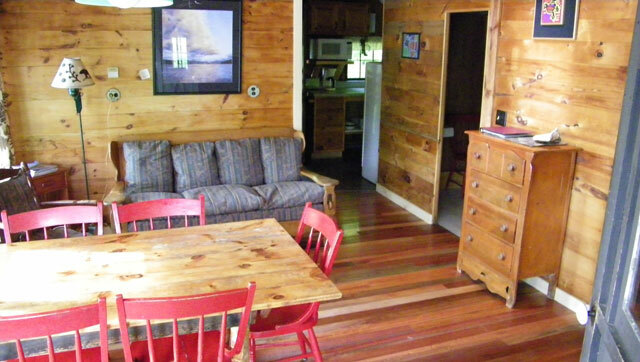 If you're entitled to any discounts and they're not automatically added, please feel free to claim them. 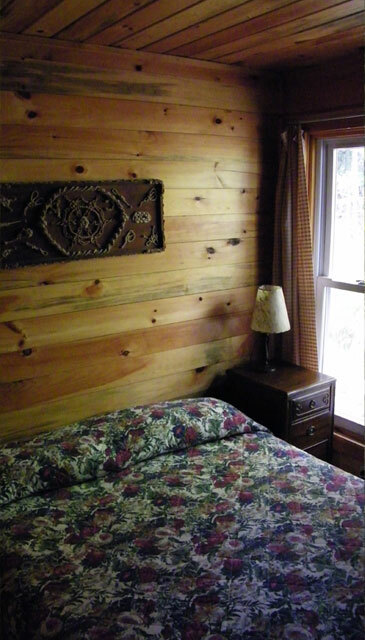 Off-season guests, visiting after Columbus Day and before May, please review the following waiver. 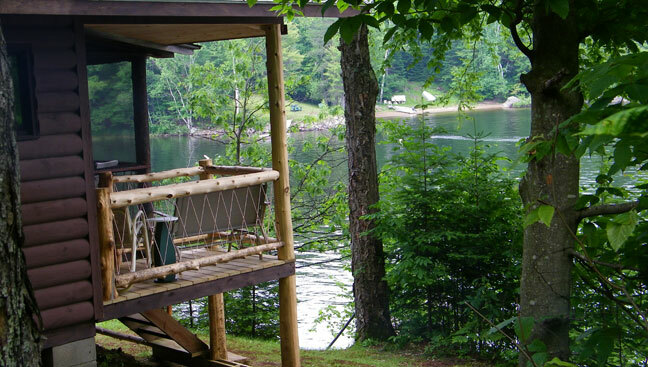 After four consecutive years - subtract 4% from the cost of your reservation. 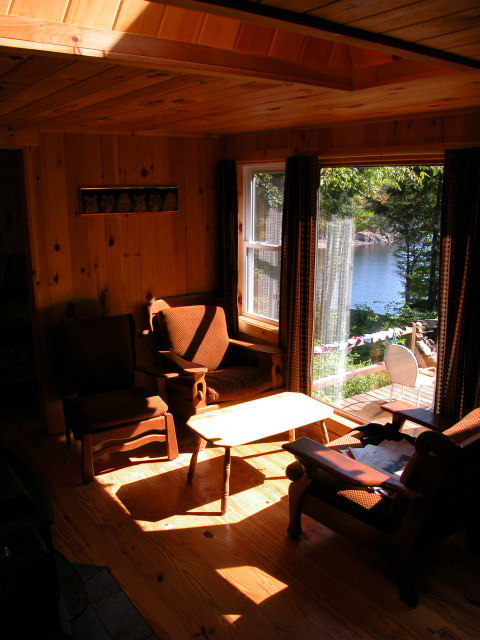 After eight or more consecutive years - subtract 8% from the cost of your reservation. 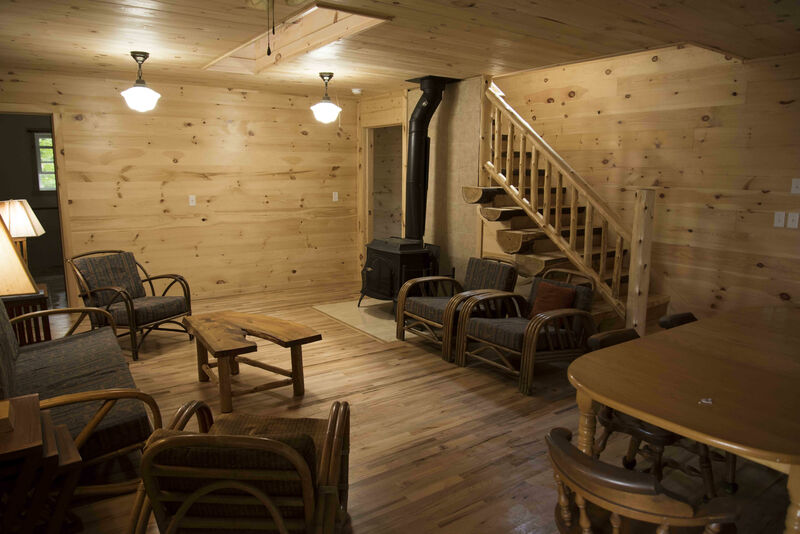 Loyalty bonuses may be combined with other applicable discounts. 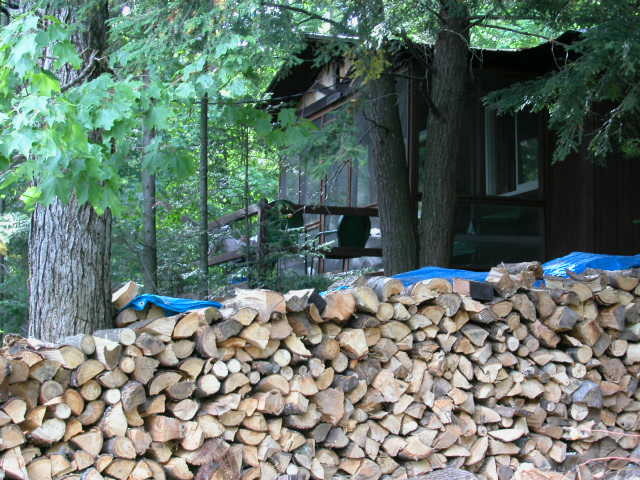 Consecutive years are calculated based on similar type stays: weekly or longer, or less than one week. 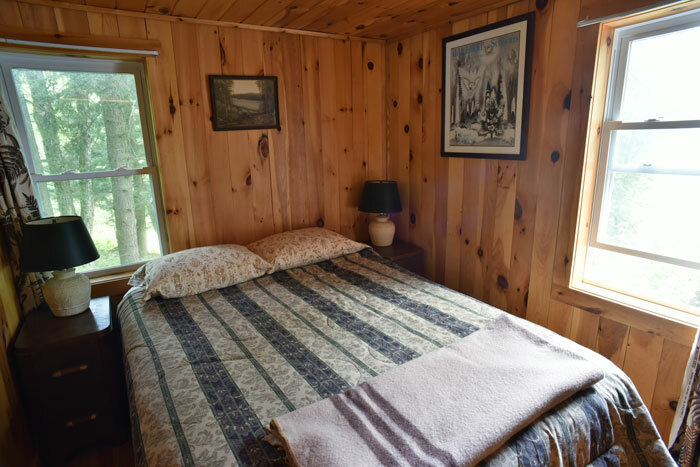 If you stay us during the Summer and Fall season (last week of June through October) come back and try us for the first time during the Late Fall, Winter or Spring and claim an extra 10% off the visit.